1 Remove the rear bumper (see page 20-260). 2. Remove the trunk side trim panel (see page 20-132). 3. 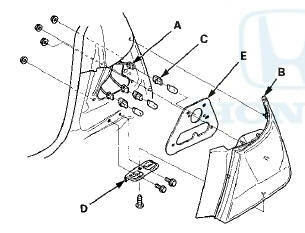 Disconnect the connectors (A) from the taillights (B). 4 . Turn the bulb sockets 4 5 В° counterclockwise to remove the bulb sockets (C). 5. Remove the mounting nuts and bolts, then remove the taillight. 6. Remove the screw and separate the taillight and bracket (D). 7. Inspect the gasket (E); replace it if it is distorted or stays compressed. 8. Install the taillight in the reverse order of removal, and tighten the nuts to 5 N-m (0.5 kgfm, 4 Ibf-ft). 1. Remove the rear bumper (see page 20-260). 4. Turn the bulb sockets 45 В° counterclockwise to remove the bulb sockets (C). 8. Install the taillight in the reverse order of removal, and tighten the nuts to 5 N-m (0.5 kgf-m, 4 Ibf-ft).